Until now, mashup music has been an interesting novelty. Notably the Encore/Numb mashup which went on to achieve massive success in clubs, and DJ Dangermouse's cult internet hit 'the Grey Album' which mixed samples of the Beatles' 'White Album' and Jay-Z's 'the Black Album' (see what he did there?). 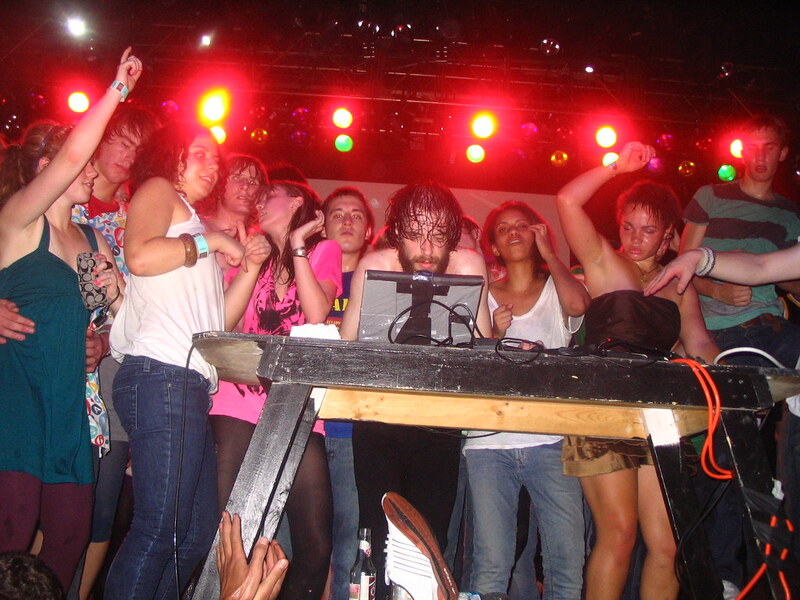 Girl Talk is a group that has taken this to whole new levels in their early albums. I say 'group' when really it is just one guy, the unmissable Greg Gillis, known for his wild antics during live performances. Gillis is unique in that he creates mashup songs featuring many many samples in each song, more than a dozen in each song, and creating 'new' songs from this. The fantastic Wikipedia page that has been assembled for the release counts some 274 samples which collectively make-up the album. His early work was... fun, but ultimately unpolished, feeling slightly like someone making a party mix rather than a fully fledged album. His new album, 'Feed the Animals' reaches new heights for him. More mature, more fluid, more cohesive. If listening to his older music felt a bit jarring or schizophrenic, you quickly get over it with this album, and what is left is a 53 minute celebration of all things musical that never feels stale and never gets old, because it changes every 5 seconds, and never gets repetitive. The first thing you feel when you listen to this album will be that it's slightly hard to get in to. It changes every 5 seconds or so, which sounds very strange at first. But listen to it for a bit and you will get used to it. When you do, it will be worth it, because this is the ultimate club mix, it is awesome, and there are some moments in this album which are nothing short of genius, mixing genres of music that you would never think go together, but do beautifully thanks to the master manipulation of Gillis (see jackson 5 mixed with bohemian rhapsody, resulting in a segment thats far better than either of those two songs on their own) One particularly stunning bit towards the end of 'give me a beat' mixes timbaland with schooly d with tom petty and good charlotte and it's truly excellent. Why does it work? Because basically these songs are collections of all the best bits of various songs all wonderfully mixed together in inventive new ways. Gillis clearly has a hell of a talent for seeing exactly what it is in music that we find moving and powerful and knows how to use it to its full effect. I can't recommend specific songs, because all the songs flow beautifully together, quite frankly there is no more of a distinction between different tracks as there are between different movements of the same track. Indeed the end of the last song on the album even flows perfectly back into the first track. And it is this amazing fluidity that makes this album such an experience. Highly recommended. Makes one wonder about the future of music, and whether others will follow in this direction. For now though, Girl Talk have taken the first steps into a fresh and unique sound, and done so with true aplomb. Really the only thing bad with this album is that you'll hear a moment of absolute genius that deserves a full 3 minute song and then it'll be over in 5 seconds and won't come back. Pity.